Costs of adaptation to climate change in developing countries are substantial. Developed countries have commitments to scale up support for adaptation in developing countries particularly in LDCs and SIDS that have little historic responsibility and will bear large relative costs of climate change. CFU data suggests that developed countries have pledged USD 3.3 billion cumulatively to multilateral adaptation funds. The largest sources of approved funding for adaptation projects are currently the Pilot Program for Climate Resilience (PPCR) of the World Bank’s Climate Investment Funds and the Least Developed Countries Fund (LDCF) administered by the Global Environmental Facility. Developed countries’ contributions to these funds remain low compared to those to mitigation; at a global level, adaptation remains underfunded. Directing adaptation funding to countries most vulnerable to the impacts of climate change as well as to the most vulnerable people and population groups within recipient countries remains an imperative with grant financing continuing to play a major role. The operationalisation of the Green Climate Fund (GCF), which is set to devote 50% of its funding to adaptation, with half of that going to the SIDS, LDCs and African states, would constitute a much needed global corrective in terms of funding for adaptation. The PPCR has approved the largest amount of adaptation finance to date, including an additional USD 61 million this year (for five new projects). This fund’s pilot approach involves supporting only a few countries with programmatic funding. In contrast, the LDCF has the highest number of projects approved (203) across 54 different countries, although individual project funding is small. The GCF has committed to allocate 50% of its USD 10.2 billion in initial resource mobilisation to adaptation (with half of this amount safeguarded for adaptation funding to LCDs, SIDS and African states). Some of the most vulnerable developing countries receive very little adaptation finance: for instance, Somalia and Central African Republic currently receive only USD 8 and USD 12 million respectively from dedicated adaptation funds The scope of what constitutes an adaptation project is wide, ranging for example from rural roads improvement to watershed management systems to early warning systems. 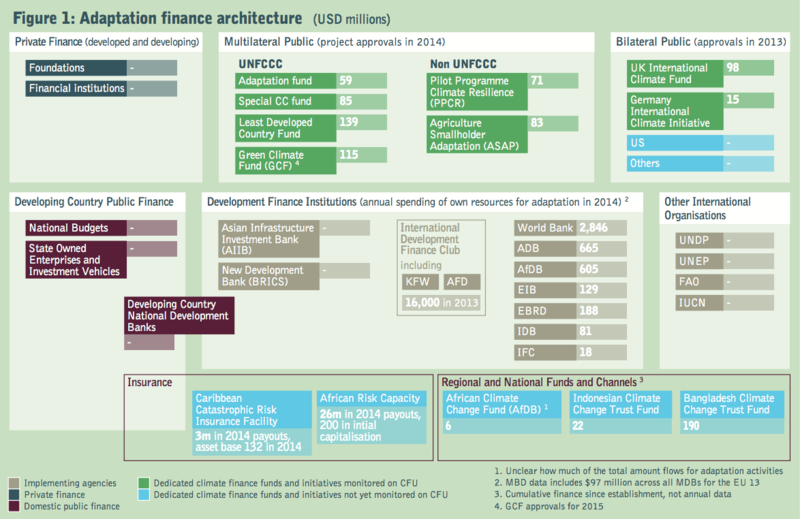 ODI_Climate finance for cities: how can climate funds best support low-carbon and climate resilient urban development?